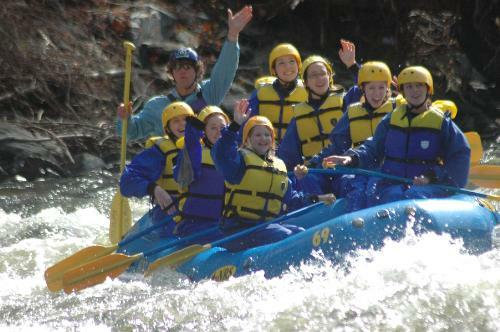 Rafting in the Smokies is an adventure-filled family attraction that has been entertaining families, groups and couples alike since 1978. The outdoor area includes a variety of fun outdoor activities. 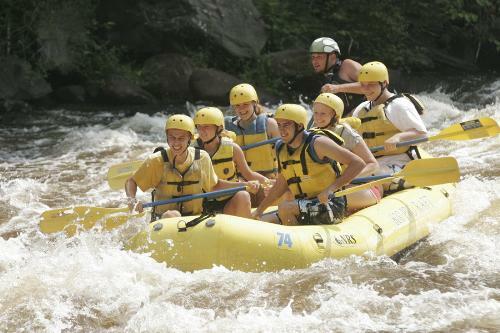 Guests can opt for exciting white-water rafting, canopy ziplining, rope course and rock climbing, family-friendly float rafting, horseback riding, swimming and more. Take time to enjoy their picnic tables with BBQ grill, swings, bean bag toss game, swimming beach, and nature trail all on their Family Adventure Island accessed by a 150-ft. swinging bridge. Need an adventure? 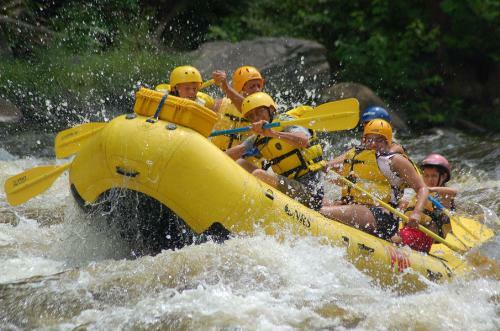 Rafting in the Smokies has one for you. 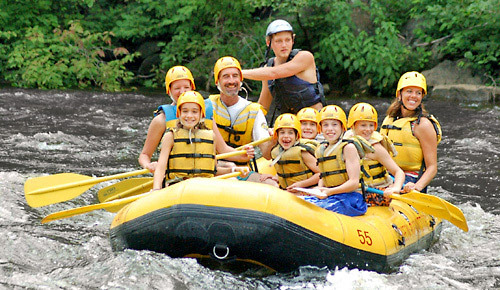 Bring your family, friends or both and experience a trip you will never forget. It will be the highlight of your vacation! 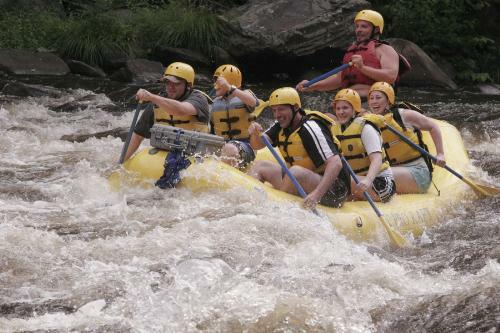 The Big Pigeon River boasts twelve class III and three class IV whitewater thrilling rapids! 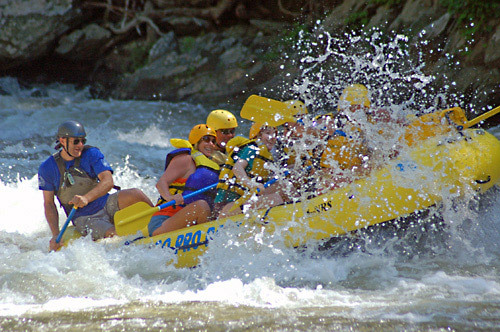 Accompanied by one of Rafting in the Smokies professional river guides, you'll be escorted down five miles of lively whitewater, rafting through class III & IV rapids such as "Too Late, Vegamatic, Razor Blade, After Shave, and Lost Guide." 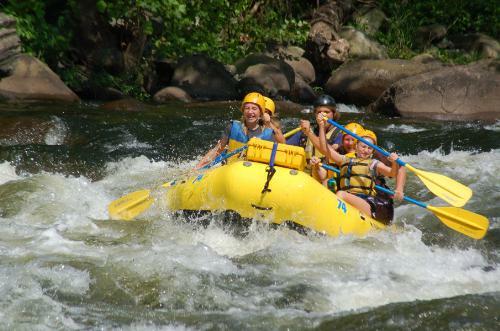 The scenery surrounding the Pigeon River is just as breath-taking as the rapids. Skirted by the Great Smoky Mountain National Park, Cherokee National Forest, Martha Sundquist State Forest and the Appalachian Trail, the Pigeon has carved its rocky riverbed through some of the most dramatic country in East Tennessee. No Experience Necessary - Minimum age: 8 years old or 70 lbs. 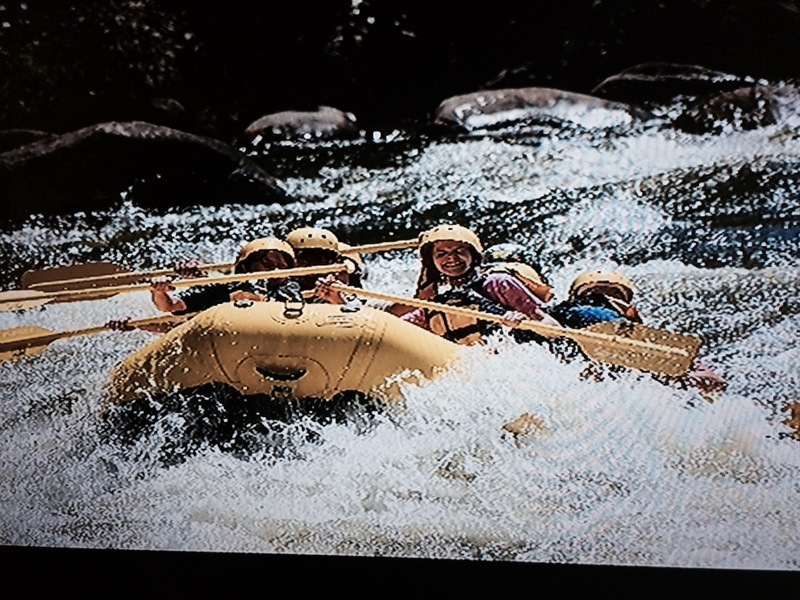 - Features 1 ½ hr of spectacular whitewater. Looking for a way to really relax and enjoy natures beauty? Do you have children who weigh less than 70 lbs? If you answered yes to either, then we have just what you need. Check out the Lower Section of the Pigeon River! 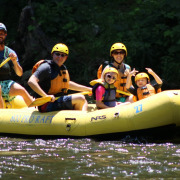 The Class I and II rapids and one Class III at the end of the trip, make this very casual and laid back section of the Pigeon River perfect for everyone 3 years old and up! 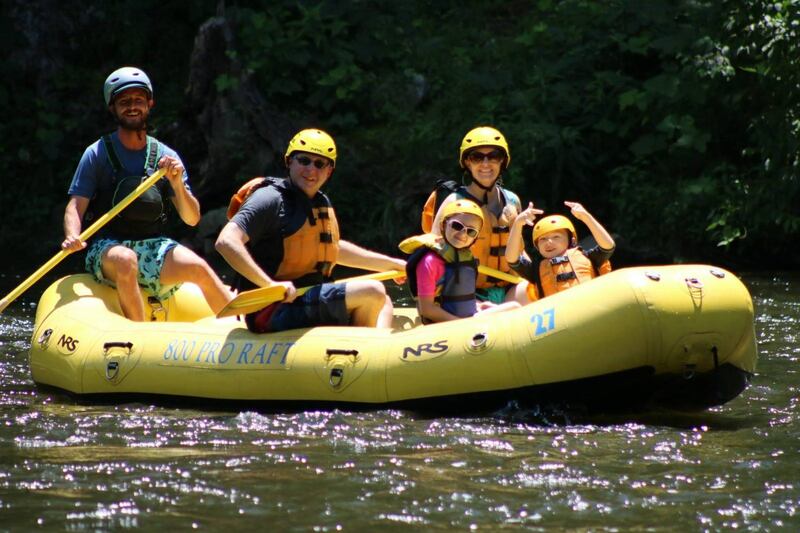 Rafting in the Smokies will assist you, your family and friends down approximately six miles of relaxing waves and rippling mountain water. 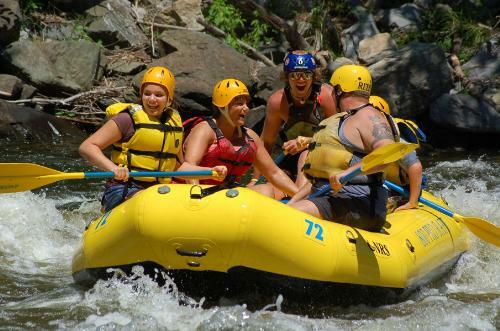 You'll gaze at the beautiful Smoky Mountain surroundings as you casually float this section of the Pigeon River. 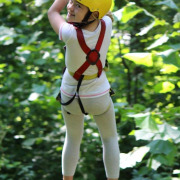 If someone in your group needs a little more adventure, we can accommodate! Let us help you plan coinciding trips on the Upper and Lower Pigeon. The portion of the group rafting the Lower Pigeon Float Trip can be scheduled to coincide with the other portion of the group's Upper Pigeon Trip. 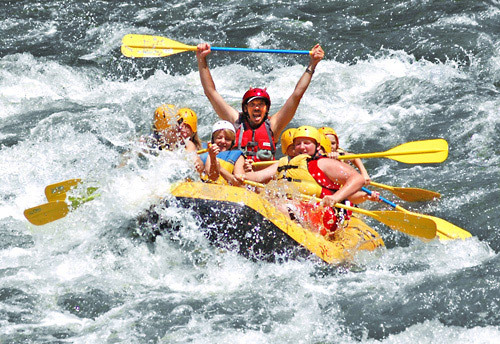 No Experience Necessary - Minimum age: 3 years old and up -Features 2 hours of introductory whitewater - Length of rafting trip is 6 miles. We offer a lot more! 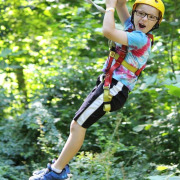 How about spending time on our Family Adventure Island where you'll zipline on our dual-racing lines and you can challenge yourself to our High Ropes Challenge Course. Test yourself! Is there a guide in every raft? Yes, there is a guide in every raft. No, you will be wearing a life jacket and we don't recommend that you swim in whitewater. The Upper Pigeon trip: you will drive to our outpost in Hartford and we will shuttle you upstream to the put-in point at the dam where the trip starts and will raft back down to our outpost where your car is and where we have changing facilities, restrooms and showers. The Lower Pigeon trip will start at our outpost and you will be bussed back after your trip. How far are you from Gatlinburg? The reservation office is located 1 mile from downtown Gatlinburg on Hwy 321 N (813 E. Parkway). 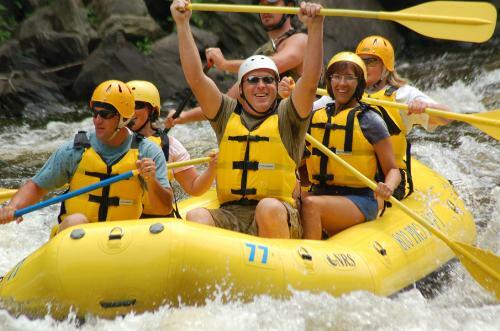 The Pigeon River Outpost is located approximately 30 minutes from our Gatlinburg office off of I-40 exit 447. There are some very large life jackets available; the chest measurement is up to approximately 56 inches. If you are not sure, we have a jacket in our reservation office in Gatlinburg. You are welcome to come by and try it on. We recommend that you make a reservation and if you do not fit in the life jacket, we will cancel the reservation without any charges. But, it would be best to come by two days prior to your trip. Sorry, anyone pregnant cannot raft, float or zipline. The minimum age/weight for the Upper Pigeon trip is 8 years old or 70 pounds. You have to be at least 3 year old to go on the Lower Pigeon Float trip. What are the times of your trips? The water level on the Pigeon River is dependent on a hydroelectric power plant. 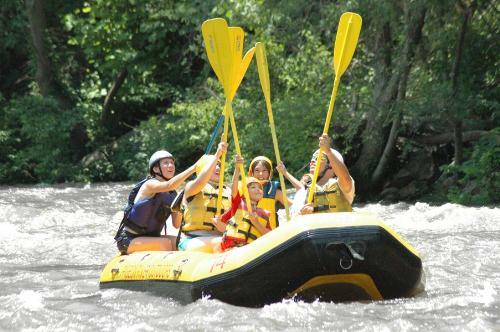 From Memorial Day to Labor Day we raft Tuesday, Wednesday, Thursday, and Saturday between 11 AM and 5 PM. 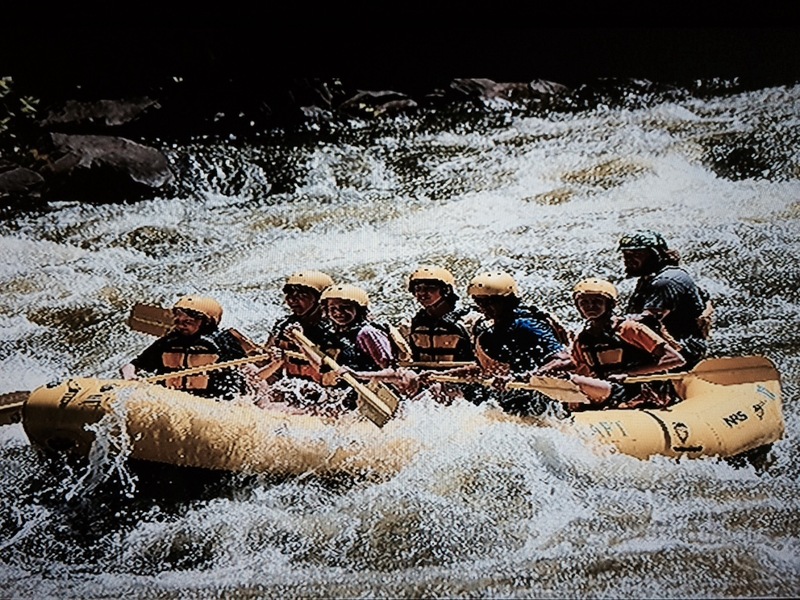 Earlier in the spring (March-April) and later in the fall (September-October) trip availability is based on rainfall as we raft the natural flow of the river. This means no guaranteed water release from the dam. 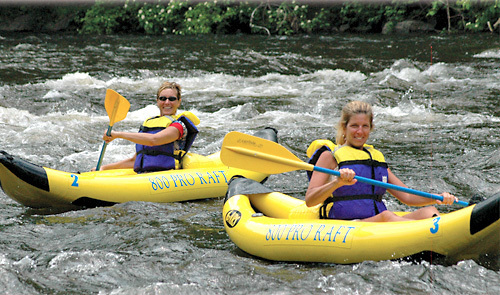 Natural flow water is great fun for team building, nature sightseeing, and playing on the water. 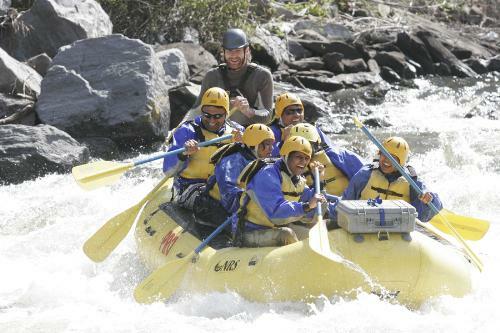 Our guides are well trained for natural flow trips and are great at making your adventure on the Big Pigeon memorable. 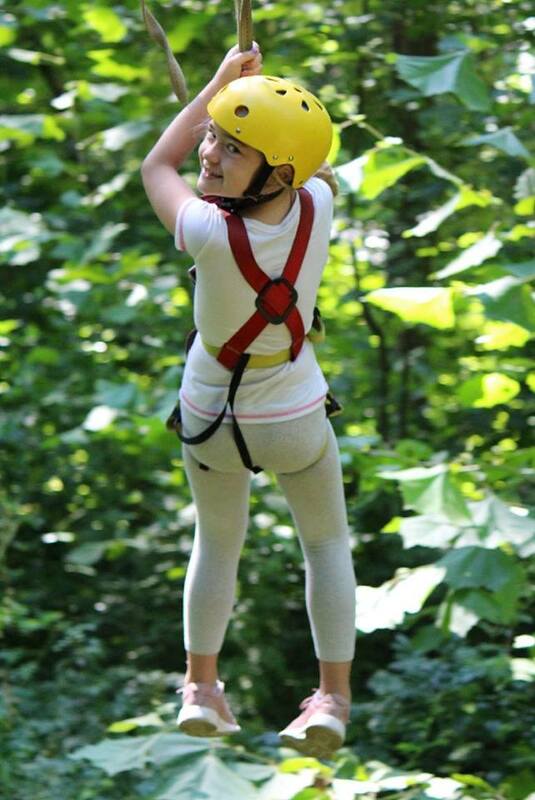 Ziplines operate from 9 AM to 8 PM every Tuesday, Wednesday, Thursday, and Saturday from Memorial Day to Labor Day and it is in your best interest to schedule all activities on the same day in order to eliminate unnecessarily travel time. 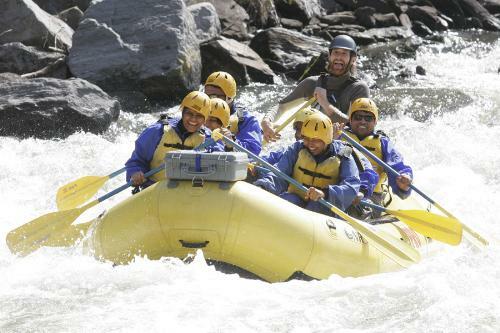 The trip time selected is your rafting trip time. 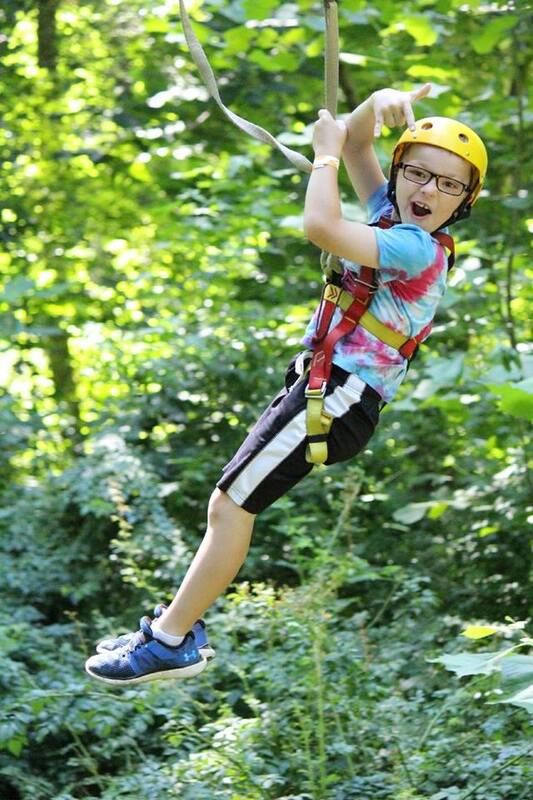 Please call the number on your e-ticket to schedule your zipline time. The best thing to wear is shorts and a t-shirt. You must also raft in shoes that will stay on your feet. No flip-flops, loose crocs or bare feet please. 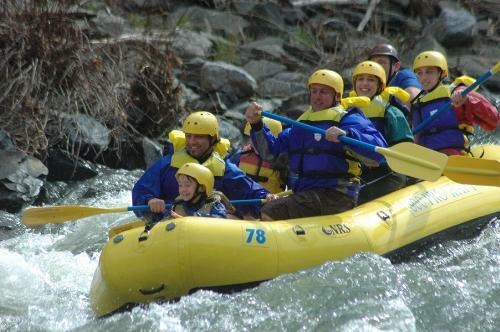 If you are rafting during the colder months, wear clothing that will not absorb much water like wool, fleece, polypro, etc. - no jeans, sweats or anything with cotton please. We provide nylon jackets and pants to wear over your clothing at no extra charge and also offer wetsuit rentals. Can I bring a camera or do you take our picture? Please do not bring along your camera unless it's waterproof. It will get wet! We do have a professional photographer who will take a photo of your raft trip. You can view and purchase your photos after trip. We usually burn them to a CD and you can print as many as you’d like. Do I need to bring anything on the trip with me? No. Our trips range from 1-3 hours so there is no need to bring anything. We recommend that you lock your valuables in your vehicle. We have a safe place for you to store your keys. We raft rain or shine because you will get wet anyway. If there is lightning in the area our river managers or trip leaders may choose to delay the trip but the trip will not be cancelled. 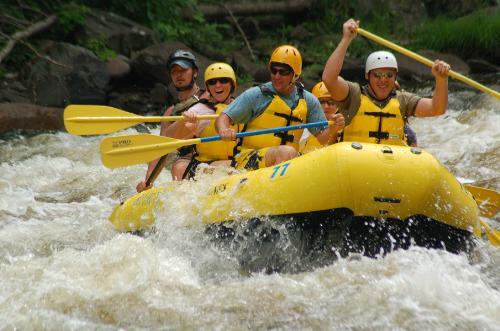 If I purchase a combo ticket, do I raft and zip on the same day? Yes, it is best to schedule all the activities on the same day in order to eliminate unnecessary travel time. Usually, we can accommodate your preferred activity schedule. Please note, the time selected in the combos is your Rafting Time. Please call Rafting in the Smokies' number on your e-ticket to schedule zipline times.